A collection of 36 high quality Photos of autumn leaves scenes with leaves falling over the photos. Also has an orange calendar at bottom right and clock at bottom left, which can be moved, removed, or changed. 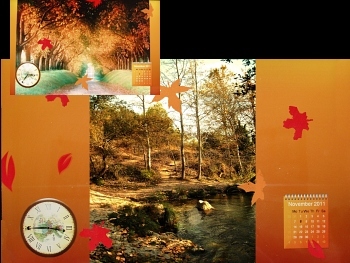 You can add your own music to this saver, remove calendar/clock, and falling leaves effects from this saver, which also supports dual monitors. F2 sets any saver image to your pc background wallpaper.Screensaver copyright, ART-TLC ©.